Topeka High visits Manhattan in a key matchup in the Centennial League. The Trojans know that to win the league title, you must go through Manhattan first. The Indians have captured at least a share of the Centennial League title for eight of the past nine seasons, while Topeka High has shared the title four times in the past six years. 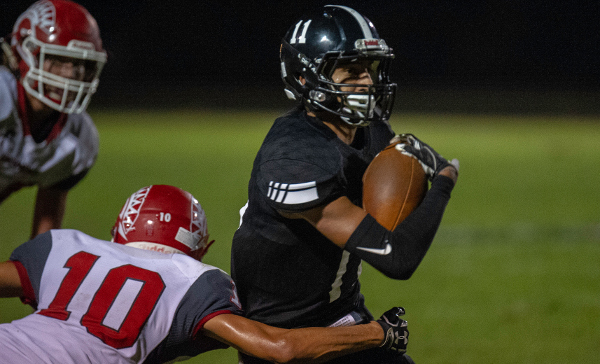 Topeka’s high-octane offense rolled to a 42-7 victory over former Centennial League member Shawnee Heights. Ky Thomas led the Trojans with 160 rush yards and three touchdowns on 20 carries. Meanwhile, Da’Vonshai Harden added 38 yards on the ground and a pair of scores. Harden also passed for 102 yards on 7 of 15 attempts. Meanwhile, Manhattan defeated Olathe Northwest by that same 42-7 score. Running back Kevontae McDonald began his senior campaign with a 126-yard, 2-touchdown effort on 19 carries. Junior Isiah Childs added 72 yards and two scores, and also caught a touchdown pass from Dayne Aschenbrenner. Aschenbrenner, the Indians sophomore quarterback, passed for 117 yards and two scores in his first start. The Manhattan defense forced five Olathe Northwest turnovers and held the Ravens to 125 yards of total offense. Manhattan has won 2 straight in the series and 8 of the past 10 seasons. For more than 20 years, Bishop Carroll has never finished worse than second in the City League. Last year, coach Alan Schuckman resigned from coaching after 22 seasons as head coach and his longtime offensive coordinator Dusty Trail took over. Carroll defeated Wichita Northwest in the final seconds in Week 1, won the City League and captured the Class 5A state title. It marked the 12th City League crown in the last 23 years. Last week, Carroll, in a battle of ranked 5A teams, fell to top-ranked Northwest, 23-22, on a last-second field goal. Bishop Carroll’s Dalton Nichols opened the game with a kickoff return for a score. Carroll, led by tight end Clay Cundiff, a Kansas commit, held a 22-14 lead in the third quarter. Cade Becker stepped in at quarterback for the graduated Braden Howell, who was a Top 11 pick and Missouri Western signee. Wichita Northwest has led Class 6A in scoring the last two years with 50 points a game. Carroll’s defense limited the Grizzlies to the fewest points since a 27-16 loss to Lawrence Free State in the 2014 playoffs. Carroll held Northwest to 58 plays for 335 yards and picked off a pass. Northwest’s season low in yards last year was 320. The Golden Eagles did have trouble with Northwest defensive end Marcus Hicks, an Oklahoma commit who had nine tackles, seven for loss. Carroll has not lost back-to-back games in the same season since a 6-3 season in 2002, according to kansasfootballhistory.com. That year, Carroll ended the season with a 21-0 loss against Liberal and a 13-12 defeat versus Goddard. The last time Carroll dropped two straight in the City League came in 1999 with losses in Week 4 and 5 to Wichita Northwest and Kapaun by scores of 14-10 and 34-8. Carroll holds a 10-4 advantage against Wichita Heights in the last 14 years, dating back to ’05. The Golden Eagles have won eight straight in the series, back to a 21-0 Heights victory in 2010. Carroll narrowly defeated Heights, 42-41, for a top-two City League finish in ’16, and then won 35-14 last fall. Last year’s contest was tied at seven at halftime. Heights quarterback K’Vonte Baker was hobbled in the game and threw an interception deep in his own end in the third quarter that quickly led to a Carroll score. Baker did not return to the game after the play. This year, Baker, one of the most electrifying players in Kansas, returns for his third fall as the starting quarterback. Longtime Garden City assistant Dominick Dingle replaced Terry Harrison, who became the Bethel College head coach. Heights opened with a solid 35-21 win against Maize South in a matchup of teams just outside the top-5 in Class 5A. Heights’ defense played solidly, including goal line stands in the third and fourth quarters. After the second stop, Baker had a 99-yard touchdown run that extended the Falcons’ lead to 28-14 with 4:05 left in the contest. Baker added an 80-yard scoring run in the fourth quarter. Last year, Carroll had an average score of 40-21, while Heights, with Baker missing part of the year, had an average margin of 37-24. Baker is going to make plays, but Carroll’s defense contained arguably the state’s best offense in Northwest. The GWAC rivals have played each other extensively, including four times in the last two years, once in the regular season and then again in the 4A-II playoffs. Scott City is 13-4 in the matchup since ’04, though Holcomb has captured three of the last four. This is generally a low-scoring matchup. In the last 17 games, the winning team has scored more than 23 points just eight times. Last year, Scott City won 23-14 in the regular season and moved to No. 1 ranked in 4A-II for part of the season. Then, Holcomb came back with a 34-13 victory in the playoffs and eventually captured the state title. This game will likely decide the GWAC title and affect the pecking order in Class 3A. Scott City opened this year as a top-5 team in Class 3A, while Holcomb took significant graduation losses. The Beavers opened with a 35-0 victory against Hugoton in a weather-shortened contest. The game ended with 1:59 left in the third quarter. Wyatt Hayes had 19 carries for a career-high 222 yards and three scores. Marshall Faurot caught a touchdown pass, and Parker Vulgamore picked off two passes. Holcomb opened with a 34-12 win against Goodland. Last year, The Longhorns produced 4A-II’s best scoring defense with just 10.7 points allowed per game, while Scott City was just behind at 11.6. More than 93 percent of the receptions graduated, along with two-year starting quarterback Trey Gilbert. Ten of the top-11 tacklers didn’t return, and Reece Morss transferred within Finney County to Garden City. Holcomb, known for its passing attack the last several years, opened with 289 rushing yards and 83 passing. Senior Jayson Lambert had 15 carries for 110 yards and two scores. Senior Peyton Ortner completed 9 of 16 passes for 91 yards. He also rushed nine times for 91 yards and three scores. Holcomb, known for its opportunistic defense and high turnover creation, forced two turnovers, was plus-1 in turnover margin and blocked a punt. Holcomb’s new starters stepped up well against Goodland, but Scott City has a bevy of depth and athleticism. The 2018 installment of the War on 24 will take place on Friday night in Rossville. Silver Lake had won the “war” 14 consecutive times until the Bulldawgs pulled out a 27-21 victory in the 2013 regular season. Silver Lake got revenge in the state semifinals later that year, winning 27-13 on its way to an 82-38 blowout of Beloit in the 3A championship game a week later. Rossville then won the next three meetings (twice in 2014 and once in 2015) on their way to three consecutive Class 3A titles from 2014 to 2016. Silver Lake has won two in a row entering Friday, including providing the only blemish on Rossville’s 2016 championship season. Silver Lake opened last week with a 46-7 victory over fellow Mid-East League rival St. Marys. The Eagles displayed good balance for an opener in rushing for 220 yards and passing for 151. Senior quarterback Mason Griffin passed for 151 yards and a score, and rushed for two more touchdowns. Classmate Christian Stoner rushed for 168 yards and three touchdowns on 15 attempts. Seniors Dillon Byrne and Wyatt Heiman led the receivers with 65 and 54 yards, respectively. The Eagle defense was led by junior Gideon Remer’s 10 tackles, including two for loss. After only posting a 2-7 season a year ago, Rossville opened 2018 with an impressive 26-14 victory over Centralia. The Bulldawgs scored 13 points in the fourth quarter to overtake the Panthers. Rossville’s offense has been known for its production from the quarterback position under coach Derick Hammes. Last week’s opener was no different. Senior Garrett Carver accounted for 65 percent of the Bulldawgs offense snaps in rushing for 204 yards and three touchdowns, and passing for 173 more yards. Carver connected with classmate Taegan Summer five times for 80 yards. Despite a lot of returning experience from last year’s team, Rossville’s defense was led by a couple of underclassmen. Sophomore Kaiden Brown led the Bulldawgs with 11 tackles, while freshman Torrey Horak added 7 stops, two for loss, and a fumble recovery. The annual Black and Blue game will take place in Frontenac where the host Raiders will take on long-time rival St. Mary’s Colgan. The game will mark the 65th meeting on the gridiron between these two storied programs. Our records indicate that Colgan leads the all-time series 42-22. The two schools suspended their football meetings for ten seasons (1960-69) when the rivalry became “too intense”. The Raiders and Panthers have split the last six meetings beginning with Frontenac’s 26-25 victory in Pittsburg back in 2012. That win ended a streak of 14 consecutive victories by Colgan in the series (1998-2011). The home team has won each of the last four meetings. Frontenac led by head coach Mark Smith, a Colgan graduate, who was a three-time all-state quarterback in high school finishing his career 38-0 as a starter. Smith’s Raiders opened last week with a 19-8 victory over Richmond (Mo.). Quarterback Jake Beckmann rushed for 116 yards and passed for 166 more yards including two touchdowns. Colgan opened on the road at Columbus with a dominating 40-6 victory over the Titans. The win by Colgan stopped a five-game losing streak to Columbus. Colgan got a big performance from quarterback Cade Simmons. The senior rushed for 209 yards and three touchdowns on 11 attempts and passed for 157 yards and two more scores. The Panthers rushed for 305 yards in the win. The Colgan defense forced three Columbus turnovers and only allowed the Titans to score on the game’s final play. This rivalry has traditionally been one where records can be thrown out the window and expected outcomes don’t often come to fruition. It should be another close, physical game where field position and turnovers may decide the outcome. The Central Prairie League rivals generally match up in an early season game where at least one, if not both teams are ranked. Victoria went 7-3 last season and defeated the Oilers, then ranked No. 1 in Division I, in the opener. The contest started Friday and finished Saturday due to weather. Central Plains went 9-2 and lost to Spearville in the state quarterfinals on the game’s final play. Victoria is 4-3 in the last seven meetings. The teams have alternated the last five matchups. The previous four years, the teams matched up in Week 1. This year in Week 1, both teams were tested by other CPL foes. Victoria went up early and led by two scores most of the second half en route to a 28-14 win against Otis-Bison. The Oilers pulled away late to beat Ness City, 30-14. Central Plains led 8-0 at halftime and 22-14 with 4:24 left. Victoria used its stable of running backs and senior quarterback Cooper Windholz, a returning starter. The Knights outgained Otis-Bison, 251-215. Windholz rushed for 42 yards and passed for 41 with a passing score and two rushing touchdowns. Tyler Knoles led with 61 rushing yards and a score. Walker Braun, limited in the second half, had 57 rushing yards and a 16-yard touchdown reception. Victoria junior nose guard Kirk Huser has impressed in fall camp and again Friday. He recorded a team-high six tackles and helped hold Otis-Bison to 13 passing yards. Central Plains finished with 162 passing yards and 167 rushing yards. Senior Myles Menges, a returning starter under center, completed 12 of 19 passes for 162 yards with a 1/2 TD/INT ratio. Like Victoria, the Oilers have a stable of running backs. Senior Alex Hickel, the team’s leading rusher last season, had 18 carries for 85 yards. Junior Lawson Oeser had five carries for 32 yards and two scores. Central Plains committed three turnovers but forced four. Senior Grant Heldstab had 14 tackles, while senior Devin Ryan had nine tackles with five TFLs. Oeser finished with 11 stops. Entering this season, Heldstab had 42 tackles in his career. Both teams have plenty of depth and an experienced starter at quarterback. If Central Plains limits turnovers, they get the edge in a home game.